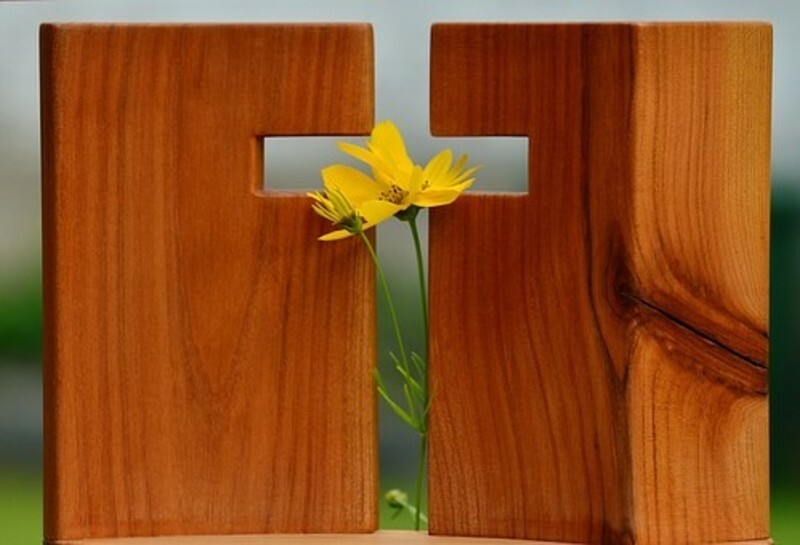 First Christian Church - SERMONS - Are You Carrying a Comfortable Cross? We all love comfort, but there is a danger in loving comfort too much. It seems that as we have continued to put more and more emphasis on being comfortable, our faith has followed suit. It’s not just the pews that are padded. If you watch “Christian” TV, the messages are padded with comfortable teaching. The doctrine has become soft, tolerant, and self-serving. In some churches, the message of the Messiah is a moral code of mush. You can believe whatever you want. Additionally, some churches next week will celebrate the pagan goddess of Easter, the Anglo-Saxon goddess of dawn, re-emphasizing the renewal of the earth this spring with bunnies, colored eggs, and flowers. The gore of the Cross and the glory of the Resurrection will be mostly lost to those who are comfortable in their new clothes and pagan traditions. Later that week, Jesus became the Passover Lamb of God when he sacrificed Himself upon a torturous Cross for man’s sin and established a New Covenant with His blood to save man from Hell and damnation. He was not a martyr! He did it all in obedience to the Father, because He loves the Father and He loves us. His self-sacrificing act on the uncomfortable Cross provided a way or anyone to be saved and to have an intimate relationship with Him and the Father. However, Jesus set conditions for following Him and experiencing this intimacy with Him. So what do comfort-craving “Christians” do with a phrase like, “take up your cross”? They simply create a comfortable idea of what it means for us today to take up our crosses, referring to even the most menial or everyday tasks and inconveniences as our cross. For those living in the first century, the Cross was the ultimate symbol of weakness. For many, then and now, the message of the Gospel—that God came to earth in the form of man and was crucified—is complete foolishness, a myth, a made-up story. Why would God use a cross of torture, death, and weakness to save the world? Today, the Cross seems more appealing to us because we’ve dressed it up. We are accustomed to seeing the Cross as a decoration, an ornament, or a piece of jewelry. But imagine people walking around with a guillotine hanging around their neck or an electric chair dangling from their ears. That is how shameful the Cross was to the first-century Jews. The Cross meant weakness, punishment, and shame. The point I’m trying to make is that God took what the world says is foolish, demeaning, shameful, and weak, and turned it into the power of salvation. For Jews demand signs and Greeks seek wisdom, but we preach Christ crucified, a stumbling block to Jews and folly to Gentiles, but to those who are called, both Jews and Greeks, Christ the power of God and wisdom of God. For the foolishness of God is wiser than men, and the weakness of God is stronger than men. Who else but God could take a cross that represented defeat and turn it into a symbol of victory? Who else but God could take a cross that represented condemnation and turn it into a symbol for grace? Who else but God could take a cross that represented condemnation and turn it into a symbol of freedom? Who else but God could take a cross that represented pain and suffering and turn it into a symbol of healing and hope? Who else but God could take a cross that represented death and turn it into a symbol of life? No one else could, but God did through the Son, Jesus Christ. What seems like the ultimate moment of God’s weakness was in reality the ultimate moment of God’s strength. Here’s why all this matters: WHAT GOD DID FOR THE CROSS, HE CAN DO FOR YOU. That is, when you are the weakest, you are exactly where you need to be for God to be the strongest. The upside-down truth of the Cross is that when you are weak, you are strong. Though it seems backward to us, God teaches us that when we think we’re strong, we’re really weak, but when we acknowledge our weakness and humble ourselves before the Lord, we put ourselves in a position to receive His power. But he said to me, “My grace is sufficient for you, for my power is made perfect in weakness.” Therefore I will boast all the more gladly of my weaknesses, so that the power of Christ may rest on me. For the sake of Christ, then, I am content with weaknesses, insults, hardships, persecutions, and calamities. For when I am weak, then I am strong. Weaknesses, insults, hardships, persecutions, and calamities: These are the uncomfortable crosses for followers of Jesus. Will we carry them with contentment? Will we trust God to be our strength? Because it’s when we let go of our need for comfort—our need to be in control; our need to glory in our strengths, our accomplishments, our paycheck, our co-workers’ approval, or whatever it is that keeps us from abandoning a comfortable version of the Cross—it is then that God does in our hearts and in our lives what he did in Christ’s death on the Cross: He takes an ugly sinful life, redeems it, and transforms it into the image of Jesus. Furthermore, He takes followers who are in trials and tribulations and bolsters their spirits. He takes followers who were at their weakest moment and uses them for enormous good in His Kingdom. He takes followers who are all but defeated and He turns their testimonies into life-giving messages of truth and hope, all to His glory. So remember, God can use you, if you are a follower of Jesus, as He used the Cross to bring glory to Himself. Will you become weak and humble and let God use you, or will you retain your comfortable cross? THE SECOND POINT often ignored is the meaning of taking up our Cross daily. We are apt to imagine that the cross we have to carry means the ordinary troubles and trials of life, but we will have these whether we are Christians or not. Our cross is something that comes only with an intimate relationship to Jesus Christ; it is the cross of denying our rights to self-determination and identifying with Jesus. Our cross is not only that we give up to Jesus Christ our rights, but that we only do the things with which Jesus is associated. The cross of identification that we carry daily is that we have been “crucified with Christ”. This does not refer merely to the fact that our old man has been crucified with Christ; it refers to the glorious, joyful liberty we experience by sacrificing ourselves for Jesus Christ every day we live! The sacrifice of ourselves is our spiritual act of worship, giving back to God the best we have in order that He may use us to glorify Himself. Therefore, I urge you, brothers, in view of God’s mercy, to offer your bodies as living sacrifices, holy and pleasing to God, which is your spiritual act of worship. The meaning of salvation and sanctification is not only the removal of sin, but a radical change of identity. I live; and yet no longer I, but Christ lives in me! My purpose is no longer self-realization or self-fulfillment, but my purpose is to become like Christ. We need to remember that we cannot bend ourselves to the will of God; that is, we cannot just compromise with God’s will and still seek to accomplish our goals, desires, and happiness. We have to be broken to the will of God! That is the purpose of our cross. There must be a daily break with the dominant ruler of our lives—self! We may be clean and upright and religious; we may be Christian workers and mightily used of God; but if the bedrock of self-realization and self-fulfillment has not been blasted out of our soul by our own free choice at the Cross of Christ, we will remain comfort-seeking Christians instead of Cross-bearing followers of Jesus. In short, we will create our own mush god, an idol, who makes us comfortable! If we do that, we will not enter the Kingdom of God, because we will still be on the throne. We enter into the Kingdom of God through the Cross of Jesus Christ, and self-fulfillment cannot get through with us; it must be left outside. We must be broken from self-realization. We must sacrifice ourselves—give ourselves daily—to the Lord Jesus Christ. Immediately that transaction is made, a supernatural identification with the death of Jesus Christ takes place, and the fruit and witness of the Holy Spirit is unmistakable: I have been crucified with Christ. I live, yet no longer I, He now lives in me! The next time you read those words, “If anyone desires to come after Me, let him deny himself, and take up his cross daily, and follow Me,” strip them of all their poetry. Think of the Cross as our Lord thought of it. When Jesus said, “let him deny himself, and take up his cross”, He had in mind not a thing of beautiful sentiment to arouse heroism, but an ugly, cruel, bloody thing, with awful nails that tears the flesh and causes death. The Cross involves pain for us in denying self in order to do the will of God. Being a follower of Christ means we are identified with His interests. We are His servants and we will suffer as He suffered in this world. The Cross is the symbol of what my personal life is for: to be given to Jesus Christ. I have to take up that cross daily and deliberately decide that I am no long my own. Individual independence has gone, and all that is left is personal, passionate, devotion to Jesus Christ through identification with His Cross. This cross of death to self is not a burden, but a joy, when I love Him with all my heart, soul, mind, and strength. In summary, Jesus Christ can take the man, who has been broken by sin and can redeem him and present him before the throne of Almighty God without a blemish, through the sheer power of His Atonement on the Cross. Jesus made a cruel, humiliating, shameful, ugly Cross something beautiful because of what He did with it. In the same way, Jesus can take a cruel, shameful, messed-up person and change him into something beautiful because of what He will do with him. Jesus has invited us to become His followers. Anyone is welcome to follow and have an intimate relationship with Him. But to follow Him, we must enter the narrow gate and follow Jesus on the narrow Way, carrying a cross of self-sacrifice. We must be broken, totally weak, and sacrificed to Him. Jesus went to the Cross where He sacrificed Himself so we might have life. To follow Him, we must take up our cross of self-sacrifice daily, presenting our bodies as living sacrifices, which is how we worship Him. Picking up the Cross is not comfortable, but it is how we experience His life—His joy, peace, and love. There is no other way. Knowing the way of the Cross, do you still want to be a disciple of Jesus, or are you comfortable with being a religious person? Will you pick up an uncomfortable Cross and follow Jesus, or are you comfortable serving a mush god of your own creation, or are you comfortable just being your own god? Anyone can have an intimate relationship with Jesus, but it will cost you your life every day. But, the consequences are eternal life, peace, and joy—today and forever. You will also suffer in this world as Christ suffered, however, you will also inherit all that belongs to Christ. If you don’t want to suffer and prefer to remain comfortable, Jesus told us what the consequences of your choice will be. Listen to His complete message. Then He said to them all, “If anyone desires to come after Me, let him deny himself, and take up his cross daily, and follow Me. For whoever desires to save his life will lose it, but whoever loses his life for My sake will save it. For what profit is it to a man if he gains the whole world, and is himself destroyed or lost? For whoever is ashamed of Me and My words, of him the Son of Man will be ashamed when He comes in His own glory, and in His Father’s, and of the holy angels. Why not give your life to Jesus today so He can give you his life, eternal life. If you try to keep your life, you will lose it. Therefore, give it to Jesus so He can give you eternal life. It is a great exchange that takes place at the Cross—your life for His life. It is not a comfortable exchange—it wasn’t comfortable for Jesus when He gave His life for you. But it is a splendid exchange, one that will give you a purpose in this world and a glorious future forever. If that is your desire, publicly confess that Jesus Christ is the Son of God, who atoned for your sin on the Cross. Make Him your Lord, by repenting of your sin and following Him in water baptism. Then you will be born again of the Holy Spirit, who will transform you into the likeness of Jesus as you daily deny self, pick up your Cross, and follow Jesus.